What's Driving African Migration, Who's Going, and Where? 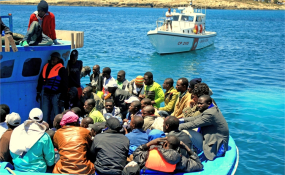 Despite many European countries fearing the increase in African migrants arriving on their shores, the survey - which collated information from 34 countries - shows that other African countries are the primary focus of migrants from the continent. "The International Organization for Migration (2017) reports that in fact more than 80% of Africa's migration involves moving within the continent. This is to some degree reflected in responses when Afrobarometer asked those who have considered emigration where they would be most likely to go. A plurality of potential migrants express a preference for a destination within Africa: 29% cite another country within their region, while 7% look elsewhere on the continent", the report shows. - On average across 34 countries, one in four Africans (25%) say someone in their family has lived in another country during the past three years. - About one in five Africans (21%) say they are somewhat dependent on remittances sent from abroad. - More than one in three Africans (37%) have considered emigrating, including 18% who have given this "a lot" of thought.A majority of citizens say they have thought at least "a little bit" about leaving Cabo Verde (57%), Sierra Leone (57%), the Gambia (56%), Togo (54%), and São Tomé and Príncipe (54%). - Among those who have considered emigrating, on average one in 10 (9%) say they are currently making preparations to move.These proportions are highest in Zimbabwe and Lesotho. - Poor people are more likely to migrate to escape hardship while those who are well off are seeking educational and business opportunities and adventure. - Among potential emigrants, more than one-third would like to move to another country within their region (29%) or elsewhere in Africa (7%). This preference for staying on the continent is especially strong in Southern Africa (58%) and weakest in North Africa (8%). Europe (27%) and North America (22%) are the most preferred destinations outside Africa. - In almost all countries, by far the most frequently cited reasons for emigrating are to look for work (44% on average) and to escape poverty and economic hardship (29%). - In line with widespread interest in intra-regional migration and the pursuit of economic opportunity, a majority (56%) of Africans think people should be able to move freely across international borders within their region. But the same proportion (56%) say they find it difficult to cross borders to work or trade in another country.